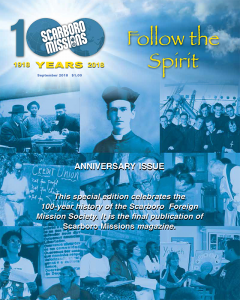 Scarboro Missions magazine is a publication of the Scarboro Foreign Mission Society (popularly known as Scarboro Missions), a Roman Catholic missionary society involved in mission overseas and in Canada. Founded in Canada in 1918 by Fr. John Mary Fraser, the Scarboro Foreign Mission Society’s initial purpose was to train and send missionary priests to China. Forced to leave China after the Second World War, Scarboro Missions began working in the Caribbean, Asia and Latin America. The articles published represent the opinions of the authors and do not necessarily reflect the official position of the Society.